Following Pablo Quintanilla’s victorious outing in the United Arab Emirates less than a month ago, the Chilean rally star has been joined by his team-mate Andrew Short in Morocco, with the Rockstar Energy Husqvarna Factory Racing duo getting their participation at the 2018 Merzouga Rally underway on Sunday. Securing eighth and 14th respectively in the short Prologue, the two FR 450 Rally powered riders are looking ahead to five long and challenging rally stages in the dunes of Morocco. 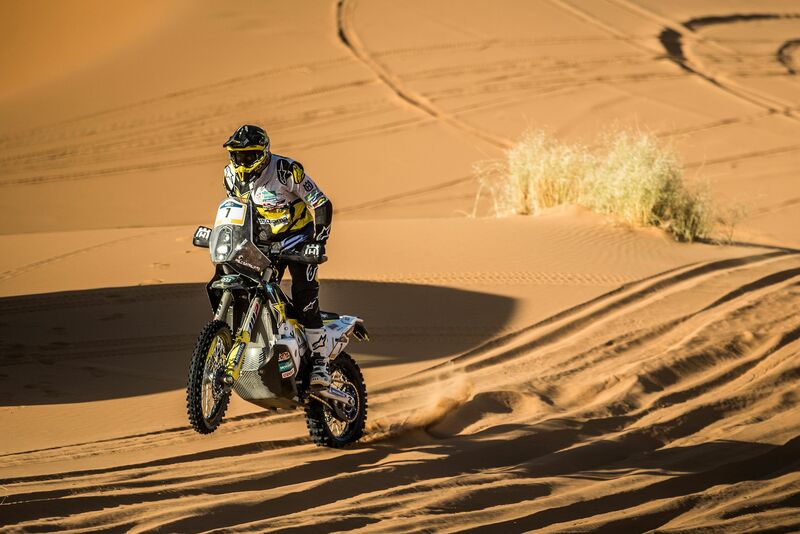 Winner of the 2018 Abu Dhabi Desert Challenge in late March, Quintanilla will be looking for an equally positive result this week in Morocco. Enjoying a good overall feeling aboard his Husqvarna during the short Prologue on Sunday, the Rockstar Energy Husqvarna Factory Racing rider is just 30 seconds behind the provisional overall leader as the Merzouga Rally is entering its first long rally stage on Monday. Back to full fitness following his injury at the Dakar Rally, Andrew Short is excited to be back racing his FR 450 Rally machine. Making full use of the experience he collected during his first participation at the Dakar last January, the American has his eyes set on a good overall performance this week in Morocco. Featuring a Prologue and five gruelling rally stages in the dunes of Morocco, the 2018 Merzouga Rally is a week-long challenge of more than 1,500km. Taking place on Monday, stage one of the event features a timed special of 206km. It will be the first of five demanding rally stages in the sandy dunes of the Merzouga Desert. Download high-res images from the 2018 Merzouga Rally here.